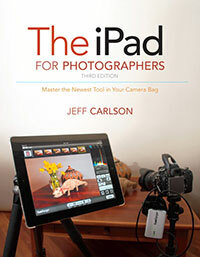 Hi, my name is Jeff Carlson, and as you may have guessed, this site is about the book The iPad for Photographers, currently in its third edition, by Peachpit Press. If you don’t yet own the book, go to Buy the Book! for links to online storefronts for the print and ebook versions. I highly encourage you to write a review of the book wherever you bought it (if you did so online). And if you have any questions or feedback about the book, please email me at jeff@necoffee.com. I can’t guarantee that I’ll always reply in a timely manner, but I do read it. Thanks! Enjoy the site and the book! PS: For more about me, go to JeffCarlson.com. Hi, I am going to buy a New iPad(or iPad3) as a first tablet and i’m interested to buy this book, but want to be sure this book is based on which iPad? iPad2 or New iPad? 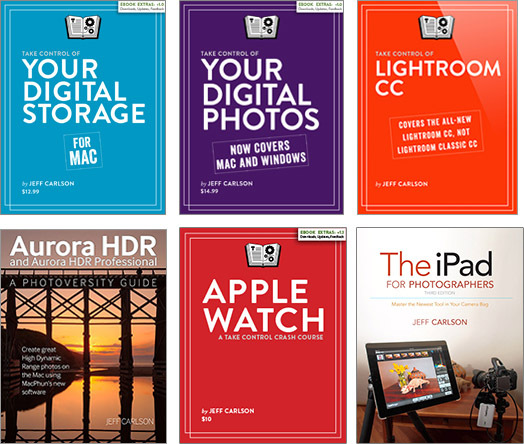 Hi, the book covers any iPad. The third-generation iPad hadn’t yet been announced, so I wrote it with an iPad 2, but all the information applies as well to the new one. If you buy a print copy of the book, it doesn’t include anything about iPhoto for iOS; Apple announced it almost literally the day the book was being printed. But you can download a free addendum that covers iPhoto and Photoshop Touch from Peachpit’s Web site. A sticker on the book points to the location, or you can find the link by clicking the Download New Pad Coverage button on this site. Could you plesse help me! I have an IPAD and a laptoop PC and Desktop PC. Reading in your book that you can transfer pictures from you IPAD to either the laptop of desktop with a Seagate Goflow Satelitte HD and Photosmith. I do not use Lightroom (althought I have it). Is this possible to do with Photosmith or not. How can I get in touch with someone from lightsmith to confirm that this is possible and how it works? Unfortunately, the interaction with a Seagate GoFlex Satellite and Photosmith currently doesn’t work. The capability is there in Photosmith, but the developers found a nasty bug in the GoFlex that was corrupting images, making the backup/transfer useless. They’re still working with Seagate to fix the problem, but in the meantime the feature has been disabled in Photosmith. You can contact the developers at their site, http://www.photosmithapp.com/. Sorry I can’t be more helpful — I’m looking forward to the feature returning, too! Hi Jeff, Wow I’m glad I read the post above. I traded in my macBookPro for an ipad and will be traveling soon and shooting lots. I was considering purchasing a GoFlex Satellite but was stopped dead in my tracks after reading your post about the nasty bug in transfer. So what’s a girl to do? Just buy a lot of memory cards? Do you have any updates on the Goflex situation or any other portable storage devices that you could recommend? Yeah, the GoFlex situation stinks, and as far as I know, there’s no immediate resolution. Yes, I’d say buy a lot of memory cards as a first step. I don’t know what type of travel you’re about to do, but another possibility is to buy an inexpensive USB portable hard drive (or two) and a USB memory card reader. If there will be times when you’ll have access to a computer (a friend, a hotel, an Internet cafe), you could copy your images from the memory cards to the portable hard drive as a backup. And then maybe even mail the drive or the cards back home so you don’t have everything with you all the time (in case everything gets stolen). Also, dependent on what type of Internet access is available, you could upload your images to Dropbox as an offline backup. That’s a pretty large online haul, so maybe you want to upload just your keepers (Photosmith lets you rate and tag images, and has a built-in service for sharing directly to your Dropbox account). I’d love to know what your plans are and how they turn out. Hello Jeff, before I bought your book I had order my new Ipad with 64 GB after reading your book I’ve decided to get the Seagate Wireless Plus. But have the problem that I can upload raw files to the drive but the Ipad does not read the raw files from the drive, they have to be JPGs for the files to open on the tablet. Is there a way around this or am I stock with JPGs. I have downloaded RAW files to the Ipad from Itunes and no problem as you know.